Like the Titanic, the warship Vasa – the pride of the Swedish Navy's fleet – keeled over and sank on her maiden voyage. The year was 1628, the captain was promptly arrested, interrogated and imprisoned - then released and no one was held responsible for the disaster. The 69-metre-long vessel capsized after being struck by a powerful gust of wind and sank after being afloat for just 1300 metres. Attempts to raise the ship – the most expensive and richly ornamented naval vessel built in Sweden at the time - failed. In 1961 - after more than three centuries on the seabed - the Vasa broke the surface of Stockholm harbour after a monumental salvaging operation lasting almost five years. The ship was so well preserved that, after being salvaged, she was able to float unaided. 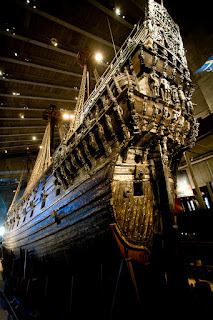 She has gradually been restored to her original glory and stands proudly in the city's Vasa Museum, Scandinavia's biggest tourist attraction since it opened in 1990 with latest figures showing 1.3 million a year passing through its doors. And it's held on to its number one tourist draw-card tag, despite ABBA the Museum becoming an instant hit with locals and tourists worldwide when the 'super troupers' music, memories and magic was revisited on permanent display in 2013. Meanwhile, scientists are battling away to try to eliminate sulphuric acid attacks that are posing a serious threat to the magnificent wooden Vasa which, in full rig, stands 52-metres tall. "Conserving does not mean that the destructive process will be stopped – it is only slowed down, according to Fred Hocker, director of Vasa Research. "Nothing can be taken for granted in working with the old ship. Still – more than 45 years after raising her – she still surprises. The question is whether we will ever be able to entirely stop the degradation process of the Vasa. If the sulphuric acid attacks are not stopped, the wood will eventually be destroyed. To gain time, contaminated artefacts are put in oxygen-free bags. This halts the degradation process," he said. Most of the visitor entrance fees are poured back into the ship's upkeep, which costs upwards of US$4 million a year. "The key to preserving the Vasa is controlling the ship's environment and addressing a series of preservation challenges. We have to deal with all of them as part of an integrated preservation strategy," said Mr Hocker. Some 14,000 individual pieces of wood were brought up to the surface when the Vasa was salvaged – everything from amazing wooden sculptures to anonymous planks of wood. When the work to preserve the ship's hull was finished in the early 1980s, painstaking work began piecing together all these fragments. The stern and aft were put together; sculptures and ornamentation regained their rightful forms and positions. Pictures of contemporary ships aided the reconstruction process, but the major share of the detective work was carried out by the museum's carpenters. In the 1990s, the next stage of work began. The goal was to erect the permanent lower part of the rigging. The work took five years to complete. Carpenters restructured the upper deck in 1998-9. 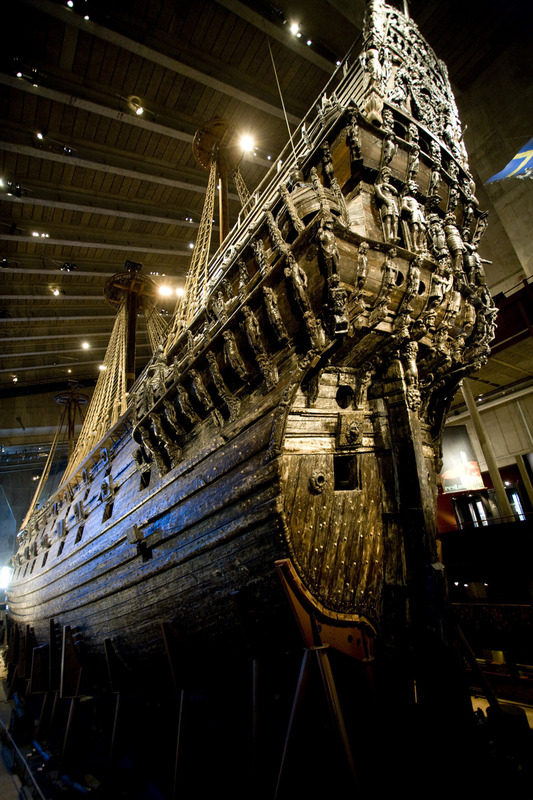 The Vasa is now the world's only preserved 17th century ship. Adorned with more than 700 carved sculptures, she is also a treasury of art. Stockholm is a walking city, brimful of attractions. Apart from the Vasa, don't miss the magnificent National Museum with its paintings by, Cezanne, Gauguin, Monet, Rembrandt, Renoir, Rubens and van Gogh. In 2000, three paintings, including Rembrandt's 'Self-Portrait' and the 'Young Parisian and Conversation' by Renoir were stolen, but later recovered. And, of course, you can't go past the Abba Museum without listening to the music and discovering quite a few secrets about Sweden's 'Fab Four'. After walking the soles off your shoes, around the waterfront, Gamla Stan (Old Town), it's time to take to the water. There are countless boat trips to surrounding attractions - everything from short ferry and sightseeing tours to all-day excursions to the Stockholm Archipelago. You will need a minimum of three days to take in the best sights in around Stockholm, but better make it five to be on the safe side. The Vasa's three masts on the roof outside the specially built museum show the height of the ship's original masts. More than 95 per cent if the ship is original, and is decorated with hundreds of carved sculptures.